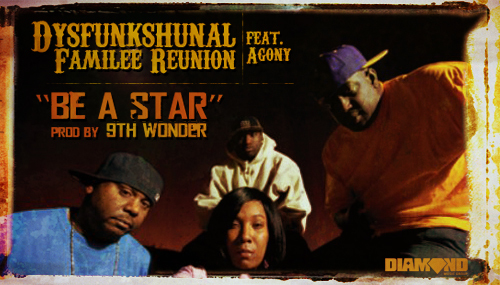 The good folks at Diamond Music group passed on this 9th Wonder produced gem from Dysfunkshunal Familee. The good folks at Diamond Music group passed on this 9th Wonder produced gem from Dysfunkshunal Familee. The group apparently dropped an album in October called Family Reunion. These are no new jacks; in 1994, they dropped a single called “New Ruff Flava,” which lead to several labels courting them. Unfortunately, they never got the chance to get a debut album out. As you can tell from their rhyme style, they’ve retained that mid 90’s vibe. There’s no nimble lyrical dexterity here (in fact, the flows are smoother on their 90’s songs), but those in their late 20-early 30’s will likely have an extra appreciation for this. Included after the current drop are some samples from their 90’s work. I must also admit, 9th got me on this sample, can’t place it.